Solar Panel Array: 2 panels in series as 1 string, 3 strings in parallel. 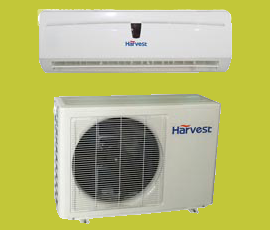 CF series solar air conditioners are classic products of Harvest Eco Solutions Limited. We design these series air conditioners for Africa, Middle-East, South Asia, Central America, Caribbean islands and other areas with good sunshine but lack of grid power supply, or with expensive electricity bill. They are also suitable for faraway area without any grid power supply, for example: farms, telecom shelters, container house etc. CF series solar air conditioners can run well in tropical areas under ambient temperature from -10 Celsius degree to +55 Celsius. All components, including compressor, indoor & outdoor fan motors and control PCB are powered by 48V DC. It is a low voltage system powered by 48V battery bank without any voltage regulation, which greatly reduce energy loss. A special soft start program makes air conditioner boosts smoothly, to extend battery bank lifespan. A wide voltage range from 44V to 58V helps air conditioner to take full use of battery storage capacity, which elevate 20% backup time. There is no any PCB inside air conditioner outdoor unit. Such design will reduce breakdown possibility of PCB under high temperature, high moisture and high dust environment. Voltage protection is available for CF series solar air conditioners. If input power higher than 58V or lower than 44V, the system will be shut down automatically. Taking advantage of DC brushless technology of compressor and fan motor, the energy consumption of 15,000btu is only 770W/hour, which is 50% lower than normal air conditioners. We design a “hybrid control box” for CF series air conditioners. Power supply will be switched to grid power automatically upon low battery (voltage of battery bank lower than 48V) if there is grid power supply available. As voltage rise up after sun rising, power supply will be switched back to battery bank automatically.